The weather has been so dark and dreary here lately. I am so ready for some sunshine but I don't think we are going to see any for a few days. Today, it's a remarkable 60 degrees! But it's not going to last long. Temps are taking a dive later. Since I was bed-bound this past weekend, I spent a little time organizing my photos (an endless task!) and signed up to use PhotoShelter to backup my most favorite photos. I used to use SmugMug but I find PhotoShelter so much more attractive and customizable. And the best part is that there's a plug-in to export photos out of Aperture straight into PhotoShelter!! Awesome! You can find my new site at Reena Walkling Photography. It was a huge task to sort and figure out which images I wanted to store there. After losing 6 months worth of photos (including over a 2,000+ from our Istanbul and Alaska trips ~sigh~) due to my hard drive crashing, I never wanted to have that problem again. But on to more pleasant thoughts! All the critters have been super active in the backyard in spite of rain and snow and cold. My little Carolina Wren comes almost daily now so I'm thinking she may be here to raise her young. All your comments were quite interesting about the multitude of places you have seen the Wren's build their nests. I'm hoping a little bird house will be enticing to her. We also have had a new visitor around lately! This kitty was sitting by our back door the other morning watching the birds. Breakfast must have been on her mind. I captured this quick photo of her expression "WHAT THE HELL" before she quickly scurried off upon seeing me. I hope she has a home somewhere. Thanks for all your kind comments on my recovery. I'm almost back to normal. Well as normal as I can possibly be at the age of 60! Normal would be having knees of a teenager. So glad you're feeling better, Reena! Don't worry about the 60s, I'll be 80 in a few months and still functioning reasonably well!! I do love your bird and critter captures for the day -- a lovely way to begin any day!! Enjoy! Glad to hear you are feeling better. That is so awful about losing your pictures, reminds me I really should look into some sort of extra backup for mind. Love the birds and squirrel; oh the little cat is very cute too. ha i love the look on the cats face...and looks like that squirrel has been packing away nuts in his belly...and glad you are doing better as well....smiles. 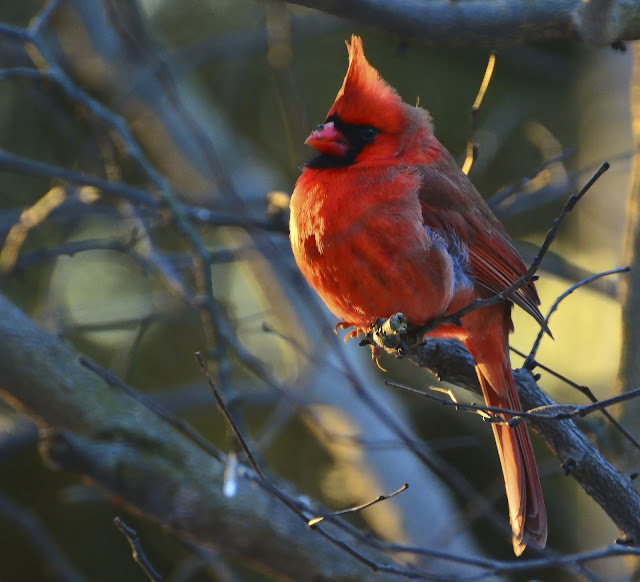 Amazing shots,I like the illumination of the sun on the cardinal.A masterpiece! Lovely images Reena -- I must have missed something -- sounds like you were down this past weekend? So sorry to hear. Hope you are doing better! Reena, first and foremost, it is so good to hear that your recovery is going well! There's not been a lot of little creature activity here, and I think it's because they know it's not lasting long, but it is so wonderful to see these photographs. Makes me believe that spring cannot be too far away. You continue to take good care of you, and have a great week ahead! Hi Reena, I really love the photo of the Carolina Wren, is it usual for them to overwinter where you are? All the birds are beautiful - of course! - but that little Wren is the best! Easy to see what's on that cat's mind, unfortunately. Look after the knees! 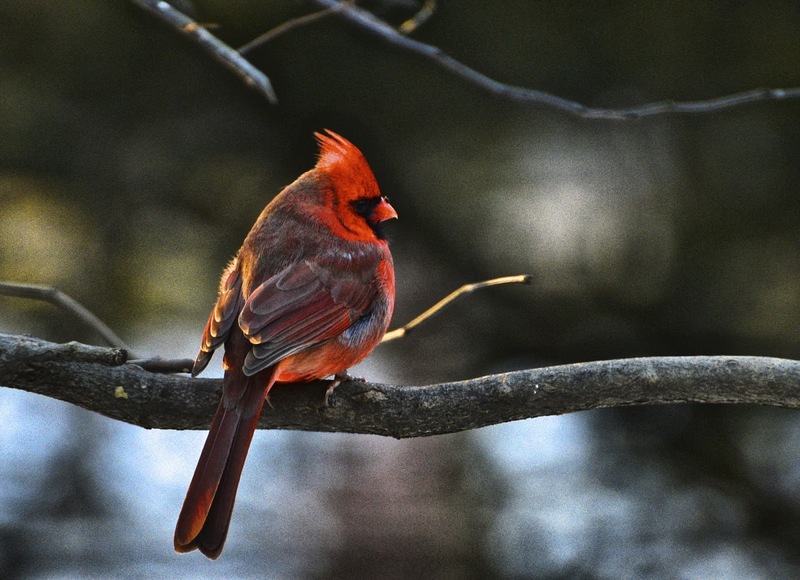 Reena, I love your Cardinal shots! Cute capture of the Peeping Tom cat! I am glad to hear you are recovering! Have a great evening! You are sounding good and you have accomplished much in your bedridden state. Bravo! The site is perfect and so you. Totally impressed. Glad to hear you are improving! I'll have to check out Photoshelter--haven't heard of that one. I saw a tweet today from the Audubon Society that cats were responsible for putting a huge dent in the overall bird population. :/ Wish they'd focus all their attention on mice and leave the birds alone. With my own life I have been missing your blog, so I'm glad to be able to visit this evening and find that you're feeling better, and your photos as always are amazing--I love the cat, it could pass as mine!! 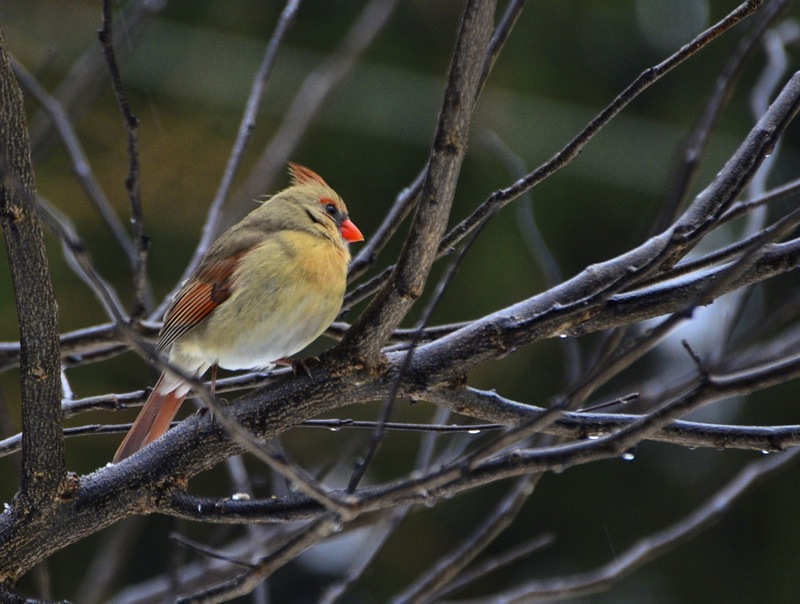 Cardinals are such a cheery sight. Keep on getting better! Glad you're doing better, Reena. And if you figure out a way to get teenage knees for those of us over 60, PLEASE let me know first, okay??? There used to be a kitty like that who visited us occasionally. Wonder if he took a trip north? Oh I LOVE your birdies - and the expression on that Cat ....PRICELESS! Reena, I hate when I get behind. I didn't realize you had been bedridden. Or if I did, I forgot, and I hate that, too! I'm glad you're better, though, and thanks for the tips on Photoshelter. These are beautiful photos - I'm amazed how many critters you still have so active around you! We hardly see any, and it's warm! Glad to hear you're feeling much better. These are such lovely shots. Hope you're out and about soon. Glad to hear that your knee is on the mend Reena, I suspect I may be heading down the same path unfortunately. 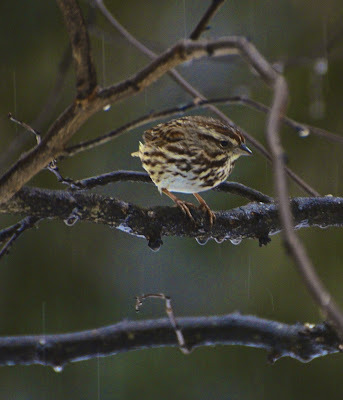 Your 'critter' images are amazing, the colourful little birds like gems in the wintery scene. I can't imagine what it would be like to lose all my photos, this just reminded me to do a backup..take care. Sorry to hear you're not feeling your usual 30 something-self. I keep several external drives for backups and a mirrored drive in case of drive failure. 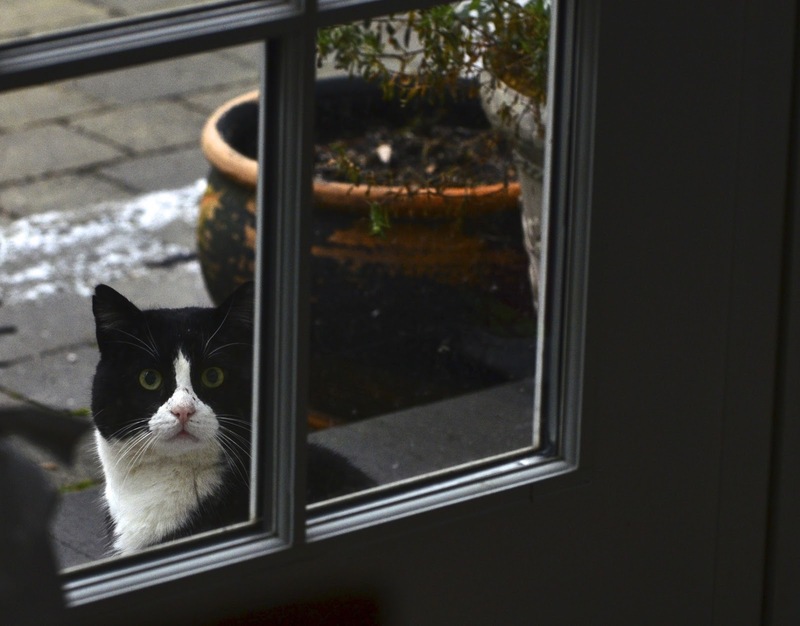 Great set of pictures - I do like the face at the window! I'm glad that you are feeling much better. You have a great collection of birds, but, you finished with a bird killer, lol. your visitor looks a lot like Kramer .. I know who difficult it is to capture an up close shot of a male cardinal, so kudos to you!! 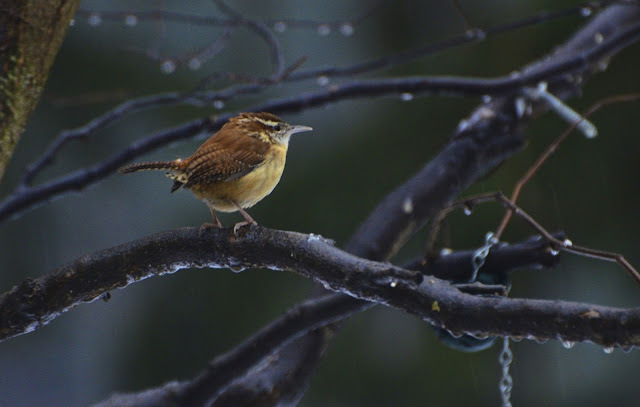 Also, love the wren shot...he pops out of the background beautifully. Here's to feeling better! So glad you are on the mend, and sorry to hear about the hard drive crashing, I guess I better look into doing something like that. 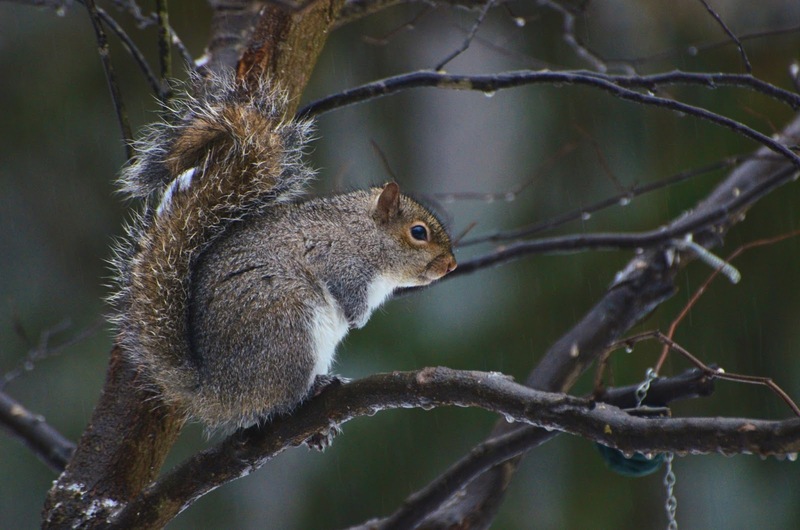 Great captures of your backyard critters! All your sweet critters make me very happy ~ especially kitty visiter! LOL! It's always a challenge organizing photos. Glad you found a good place to store them! so glad you're feeling better, reena dear! always good to see your back yard friends. you daily....alot of hope in that. Heck, I'd be happy to have the knees I had at 50! All words and images are subject to copyright. If you would like to use any content please email for permission. Thank you. 20 years from now you will be more disappointed by the things that you didn't do than the ones you did do. So throw off the bowlines. Sail away from the safe harbor. Catch the trade winds in your sails. Autumn Sky Ranch - Happy Holidays! Where in the world is Kat? A View Of The Lush Vermilon Forest.